The historic overlay maps presented on North Carolina Maps enable users to compare historic maps with current maps and satellite images. The following instructions address navigating, zooming, and "seeing through" the historic overlay maps presented on this site. Double-click anywhere on the map. Click on the plus sign on the left navigation bar. Move the bar icon up the slider on the left navigation bar. Users with a scroll wheel on their mouse can move it up (away from the user) to zoom in. Click on the minus sign on the left menu bar. Move the bar icon down the slider on the left menu. Users with a scroll wheel on their mouse can move it down (toward the user) to zoom out. By clicking once and holding down the mouse button, users can drag the map in any direction. The arrow buttons at the top of the left navigation bar can also be used to move the map. By clicking on the box labeled "Fade Historic Map," users can make the historic map image semi-transparent, enabling them to see through the historic map and compare the older map image with the current map or satellite image underneath. Clicking again on the "Fade Historic Map" box will restore the historic map to its full opacity. 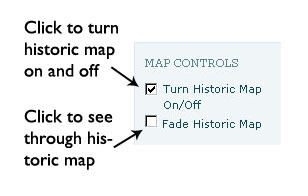 By clicking on the box labeled "Turn Historic Map On / Off," users can remove the historic map and look only at the background layer. Clicking again on the "Turn Historic Map On / Off" box will restore the historic map image. 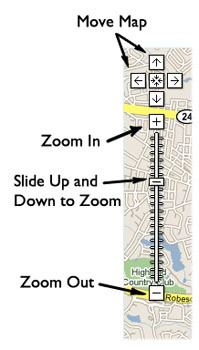 When the map is turned off, the current location and zoom level will be maintained. Turning the map on and off like this can be an effective way of comparing the historic map with the current map or satellite view underneath. The background layer on the historic overlay maps is provided by Google Maps. Users have several different background options. The default is the "Hybrid" view (a combination of the street map and satellite image), but users can also pick "Map," "Satellite," or "Terrain" views. The map view shows a basic street map, with streets and roads, highways, and some geographic features such as rivers, creeks, mountains, and lakes. The satellite view shows a recent satellite photograph of the area shown by the historic map. The satellite images can vary in amount of detail shown from one region to the next. The hybrid view shows a recent satellite photograph, as well as the names of streets and geographic features. The terrain view shows the elevation of the area shown by the historic map. Elevation is shown through contour lines, illustrations, and shading. The names of streets and geographic features are also included in this option. Many users will find that if they continue to zoom in on a historic overlay map, the historic map image will disappear. This is because the user has gone beyond the maximum zoom level available for this map. On each map, there is a point when zooming in any farther would result in a blurry, hard-to-read image. Simply zoom out one or two times in order to see the historic map again. All of the historic overlay maps presented on this site can be viewed in Google Earth. Google Earth is a free software application for viewing and exploring geographic information. To learn more, or to download a copy, visit http://earth.google.com/. 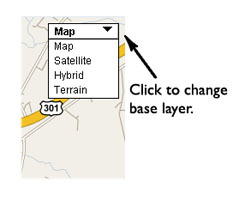 Clicking on the "View in Google Earth" link on the map overlay pages will download a small file with a .kml extension to your computer. If Google Earth does not launch automatically, double click on the .kml file to open the program. You must have an active internet connection in order to view the maps from this project in Google Earth. Select historic overlay maps are available for download in a format suitable for use in Geographic Information Systems (GIS) software. Please visit the Davis Library GIS page for more information.